At the start of every New Year, people start to look at setting goals and improving themselves during the upcoming year. Goal setting is the key to success; it serves as your road-map to your martial arts, fitness and personal goals. Goal setting is not easy, but can be learned. If done properly it can help you reach new personal goals or get back into training at the dojang if you have been absent from class for a while. One thing is certain and that is your goals will only mean something to you if they are yours and you take ownership of them. As an example, I remind students all of the time that they need to be consistent in their training and class attendance. In reality, many aren't consistent and don’t achieve their full potential in Tang Soo Do. The goal for regular class must be yours. For your goals to truly encourage you, the must not only be specific, but that must also be realistic. A goal that is unrealistic such as being able to do a five board jumping kick break without the proper training will only frustrate you and lead to failure. That’s not to say that you shouldn't aim high because remember that we are motivated by goals that are just a little beyond our reach. Just start of with easily attainable goals like the example of regular class attendance and don’t let excuses get in the way! Now to the hard part. Find a nice quiet place to sit down and do some serious soul searching. Some mediation might help to or get to our Yoga class with Lori! She is extremely motivational! Write down not only your personal achievement goals but also goals for your Tang Soo Do training and personal fitness level. 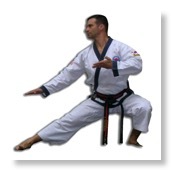 Training in Tang Soo Do at least three days per week is an excellent goal. The more you put into something, the more you get out of it! If you want to be able to spar like some of our seniors in class it is going to take not only hard work but hours hitting the dojang and practicing free sparring techniques with other students before class, during class and after class! On the other hand if you want to be more proficient in your hyung, than this is something that you may be able to do at home in addition to regular class attendance. Additionally, take a look at your nutrition as nutrition plays a key part to overall athletic performance and well-being. Maybe your goal may be eliminate one or two things from your diet that are unhealthy such as junk food. If you really want to get tremendous results with your nutrition get on the Advocare 24 Day Challenge (see my results in the article below)! For more information on the Advocare 24 Day Challenge visit our page here or you can call Mrs. Karen Garbowsky direct at 412-670-3801. Now get too it! Start setting your goals now!